Way back in May of 2016 when NVIDIA launched the Pascal architecture powered GeForce GTX 10 series, one of the notable features they announced for the product family was support for Netflix’s newly launched 4K streaming option. At the time no PCs could access the service; due to the tighter DRM requirements imposed by Netflix and its content providers, PCs that wanted to stream 4K Netflix would need to support HDCP 2.2 and Microsoft’s PlayReady 3.0 DRM. Pascal in turn was the first GPU that was released to support the new DRM standards, and while NVIDIA didn’t know exactly when support would launch, the expectation was that it would be sooner than later. However as the months have ticked by, we never did see any further progress from NVIDIA and Netflix on enabling 4K support. And rather unexpectedly, NVIDIA even ended up being surpassed in the PC space by Intel, who became the first vendor to actually launch 4K Netflix support when it was enabled on their Kaby Lake CPUs back in November. Now just shy of a year later, NVIDIA and Netflix have finally taken the next step towards launching 4K Netflix support on Pascal. 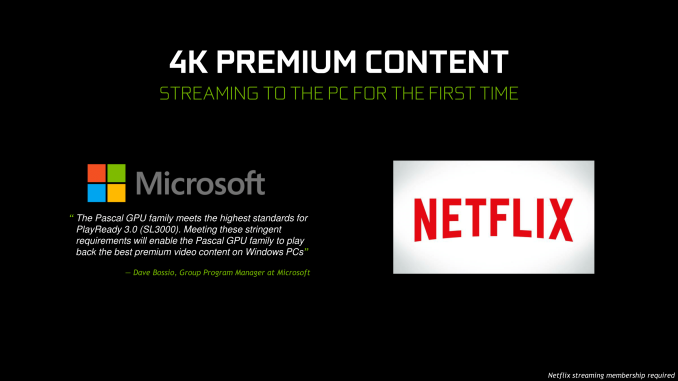 In an article posted on NVIDIA’s customer support portal, the company has (quietly) announced a 4K Netflix technology preview, allowing customers with the right hardware and software configurations to access Netflix’s 4K streams via both Microsoft Edge and the Netflix app. While the article itself doesn’t offer any real explanation for the delay, the system requirements end up giving us a pretty good hint about what’s going on. Along with the expected hardware requirements – a Pascal-based video card and an HDCP 2.2 monitor – the Netflix preview also requires that users are on a Windows Insider build of Windows 10. The NVIDIA article notes in particular that receiving Insider builds is necessary to get the specific NVIDIA driver version supported – 381.74 – as it’s only being distributed as part of the Insider program. NVIDIA doesn’t make much mention of the OS itself, but the situation is especially interesting since this comes just weeks after Microsoft launched the Windows 10 Creators Update, their latest major update to the OS. According to Microsoft’s API documentation, several new calls were added to PlayReady in this update. This strongly hints that Windows 10 itself was the piece of the puzzle holding back 4K Netflix support. Further complicating matters however, with the release of the Creators Update, the Windows Insider program is now in early testing of features that will be going into the next version of Windows 10, codenamed “Redstone 3”. So it’s not clear whether the recently-released Creators Update is even enough, or if support hinges on additional functionality intended for Redstone 3. In any case, for the moment NVIDIA is calling this a preview, presumably due to the Insider OS requirements. Despite this qualifier, 4K Netflix support should fully work on all Pascal GPUs with 3GB or more of VRAM, though this means that 2GB GTX 1050 cards are oddly excluded. NVIDIA does note however that support isn’t currently working with SLI configurations, and in that scenario the video cards need to be unlinked first. NVIDIA has also posted a helpful chart on HDCP 2.2 compliance, noting that 4K support is only available when all active displays support HDCP 2.2; any active HDCP 1.x displays will limit the stream quality to 1080p.